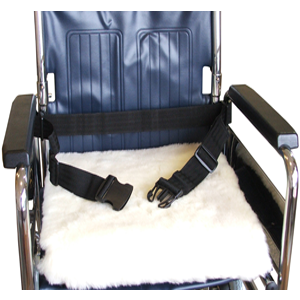 We offer two different styles of lap strap, style 1 has been designed primarily for use with wheelchairs. It is secured around the backrest frame while style 2 is mainly for use with scooters but can also be used with wheelchairs. We offer two different styles of lap strap, style 1 has been designed primarily for use with wheelchairs. It is secured around the backrest frame while style 2 is mainly for use with scooters but can also be used with wheelchairs. Both lap straps use a snap-lok fastener and are adjustable to fit everybody, the total length of the LS - 1 strap is 56" (1422mm), LS - 2 strap is 64" (1626mm). These are not seat belts and must not be used on vehicles travelling in excess of 8mph.